Awhile back, my husband and I heard a message that absolutely transformed our finances. Why? Because this one message taught us what God’s Word says about how to make our giving WORK like God says it should. The message is from Pastor Jesse Duplantis, a man of God that I GREATLY respect. I love Pastor Jesse’s teaching, and my husband and I support his ministry. He teaches the Word of God with full faith and no apology, and he’s blessed because he believes what God said. I want that kind of blessing and faith too, don’t you? 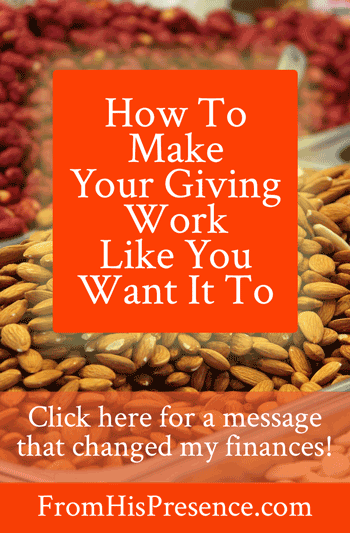 The Bible says there are 4 types of giving: tithing, firstfruits, alms, and seed. Each type of giving is motivated by a particular thing, and it carries a particular result promised in the Bible. The problem comes when we get the types of giving and their results mixed up. For example, tithing produces particular blessings. It will always produce those blessings. However, it does not produce the same blessings as seed–or even as firstfruits. When we need the blessing of seed but we expect it to come from the tithe, it won’t work. Maybe you need the blessing of the seed. But you don’t know what makes seed different from alms, so you give alms–praying for the results promised by seed. It won’t work, because alms produces alms-blessings and seed produces seed-blessings. But you have no seed in the ground; you only have alms. Tithing produces tithing blessings. Seed, alms, and firstfruits all produce their different kinds of blessings too. And then do the type of giving required to get that blessing. This is an essential message that we all need to understand if we want to be blessed in our finances. And fortunately, it’s on YouTube! I placed the sermon below. Listen to this message; take notes; and listen to it again if you need to in order to make sure you know which type of giving goes with what reward. Thanks for sharing Jamie! God has an order of how He blesses us in so many ways and we will ve blessed more than we can imagine if we will follow His order! Jesse Duplantis is living proof of following God’s instructions and this man is mega blessed financially! We would do well to do to ask ourself if what we are doing is working? If not, get in the Word! Follow the instructions of the Word! For the Word works! Hubby and I are givers however I am going back to the “drawing board” of our giving and changing the assignment so that we are giving in accordance to God’s plan! Will later on give a testimony of how our finances have changed! Thanks again! Angela, it’s great to re-calibrate our finances every now and then! Like a garden, we wouldn’t sow only corn if we knew we needed a potato crop as well as a corn crop. So we have to think from the end result and figure out what we need–and then place our money and offerings accordingly. If I need to be blessed and have the devourer rebuked (which I majorly do, every day, always), I always need to pay tithe. And if I need a particular financial need met that I can’t handle, I need to sow seed into ground that can produce that kind of harvest. I get so particular with my seed that I sow into people who have what I want, even if they don’t need the money. If I want a particular revelation, I sow into someone who has it. If I want a certain opportunity, I sow into a ministry that has it–and then I pray and ask the Lord to bring me the same thing. He who honors a prophet receives a prophet’s reward, and he who honors a righteous man receives a righteous man’s reward! You give tithe to you local church, and I think I understand that now May someone tell me about what is first fruits, alms and seed and please explain the benefits of them as Jamie has explained to us tithe giving.
. It will thrill you! I give (a small amount) to your ministry, but this is exactly why! It was a strategic move because I love what you’re doing, I feel good about why you’re doing it, and I wanted to link arms with you. It’s a blessing to me to know that I’m supporting your ministry. Thank you so much for your help, sis! Trust me–EVERY amount matters! I thank you SO very much for helping me; every dollar helps us reach more people every day! And by the way … I pray over those seeds too! I recognize that people are sacrificing, and I want you to get the return you want! So I pray that you and every donor would not only receive spiritual impartation from me, but also financial harvest of the 30, 60, and 100-fold return. Just wanted you to know that! Jamie, I understand the differences between tithe, first fruits , alms giving, seed offering and the motivation plus benefits of them but what if I didn’t pay first fruits on the first paycheck in 2017? Should I retro back and pay it now? Also I’ve heard it preached you should tithe on a material gift such as furniture, a car, clothes etc. Is this true? I was always taught you pay tithes on a financial blessing such money, property, etc. Which is correct? By the way, God has blessed my husband and me since I quit paying tithes on his income secretly and asked if I could. I did have to explain how it will bless us! That’s been 1 1/2 years ago. Hey Angela, here are my personal thoughts about some of these things. 1 – If you didn’t have the revelation about firstfruits then, don’t beat yourself up. But I would pay firstfruits on the next increase you have, as if you were starting a new year now. That’s just my personal thought on it. You take your situation to the Lord and ask Him, though–and He will show you what you should do. 2 – I would not feel comfortable proffering an opinion about tithing on material gifts. I have tithed before on things that were an increase to us, for example, free airfare for somewhere that we would have had to pay for. I have also NOT tithed on some material gifts because they were not increases, but burdens. (“Here, take this junk… you’ll enjoy it! My gift to you!”–and then we’re burdened with trying to get rid of someone else’s junk.) I really don’t know, so again I would definitely take that to the Lord and ask Him to show you out of Scripture. 3 – I can see why Papa would bless you more after you stopped being secretive about it. He values unity in marriage! Great job! and thank You, Lord! Jamie, Thank you so much for your ministry. I downloaded and prayed the prayer about injustice because my car was hit when I was parked in a gas station while on vacation–I wasn’t even in my car. The other driver’s insurance company had been debating since early April about paying to repair my car. Then two weeks ago, they called me and said they would pay for my car to be repaired at the shop of my choice. I know it was an answer to the prayer for justice that I prayed. Thank you so much! Praise God! I love this testimony! Thank you so much for sharing! Unfortunately the video did not open, I will keep on trying to download. Thanks for loving us this much if it is not so you would not be sharing the Word of God with us. Who are we supposed to give the tithes to? The Church we go to on a Sunday? Hi Anne! Great question. You can read more about that here. Pastor Jesse said of the 4 types of giving, 2 are solely to GOD ie tithing and seed, 1 is to both GOD and man ie first fruit, and 1 solely for man ie alms. I would truly appreciate it if you could do a piece for the others like you did for tithing. Specially for seed. What is seed? What is good soil? Examples that you and your husband did, as you had mentioned it changed your financial life forever. The video did not provide enough. Your explanation of tithing was thorough, helpful and actionable. Thank you so much, and GOD bless. and many blessings to you. May the Lord bless you in all areas of your life, in abundance!! !